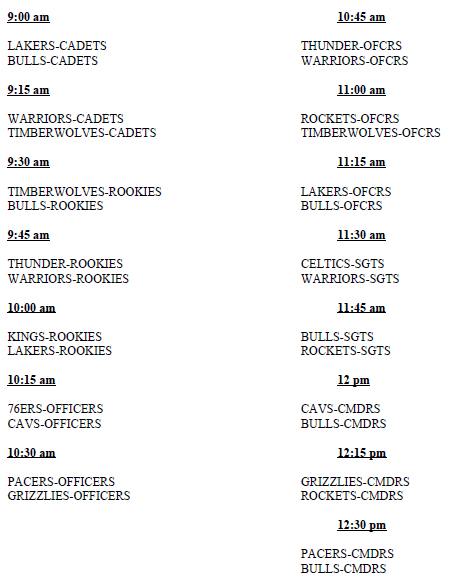 The camp is FREE to the first 100 campers to sign up. 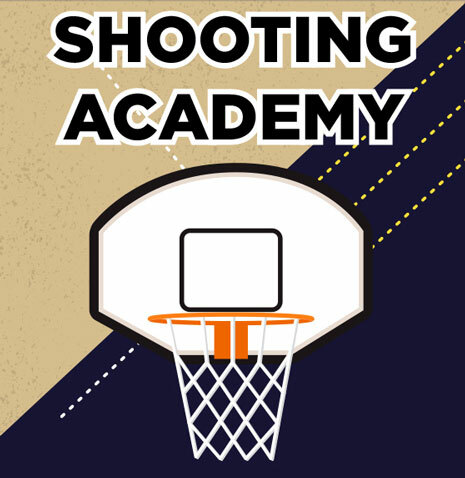 It is open to boys and girls grades 3-6. 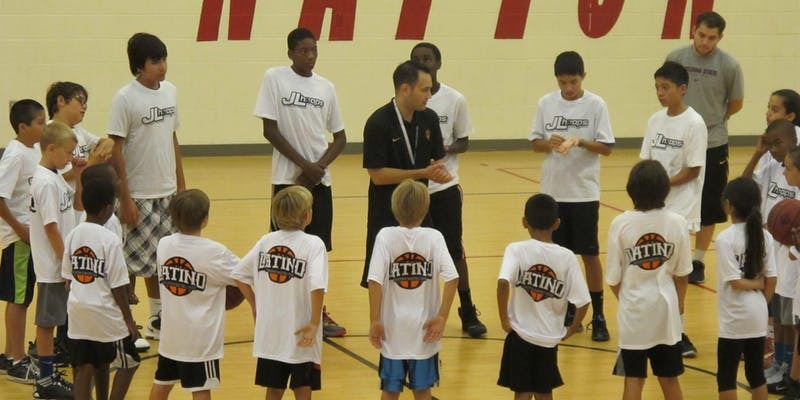 The camp is sponsored by the Latino Association of Basketball Coaches. 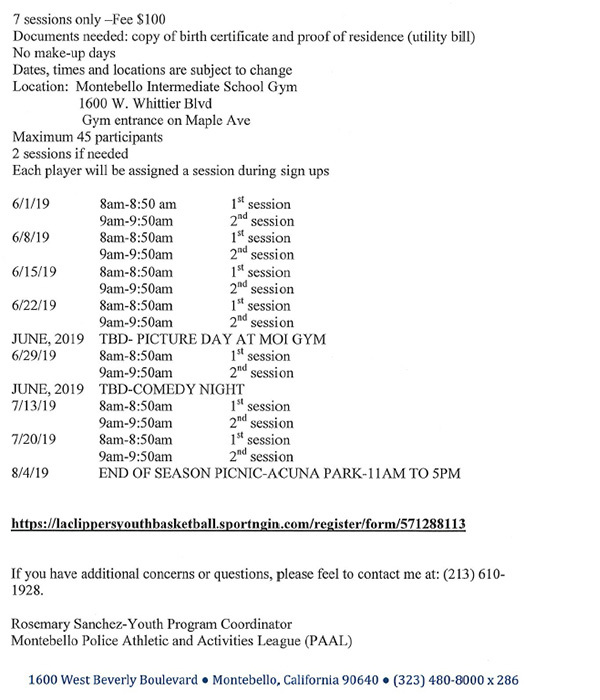 Registration fee: $100 (cash or check) – includes uniform, Team picture, & end of Season Picnic. FULL REGISTRATION FEE due at the time of sign up. Must provide copy of birth certificate, proof of residence (copy of utility bill or school report card with address or student profile sheet). Child must be present for uniform sizing. 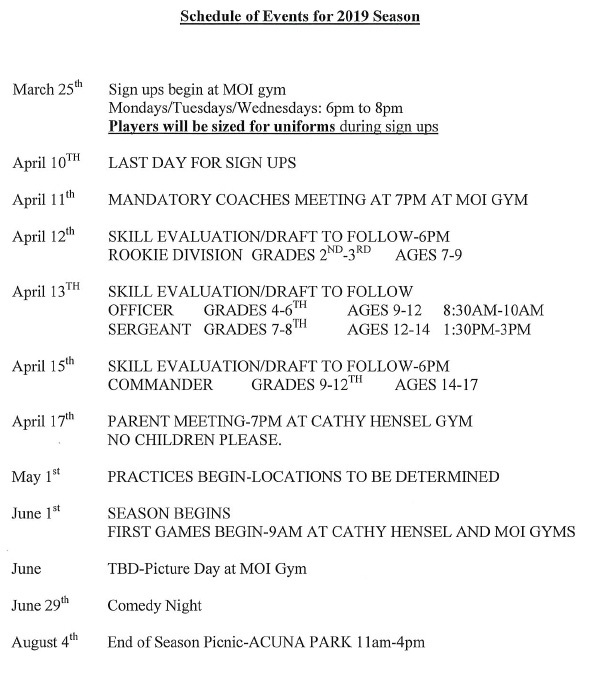 Additional details or questions: rsanchez@cityofmontebello.com or (213) 610-1928. 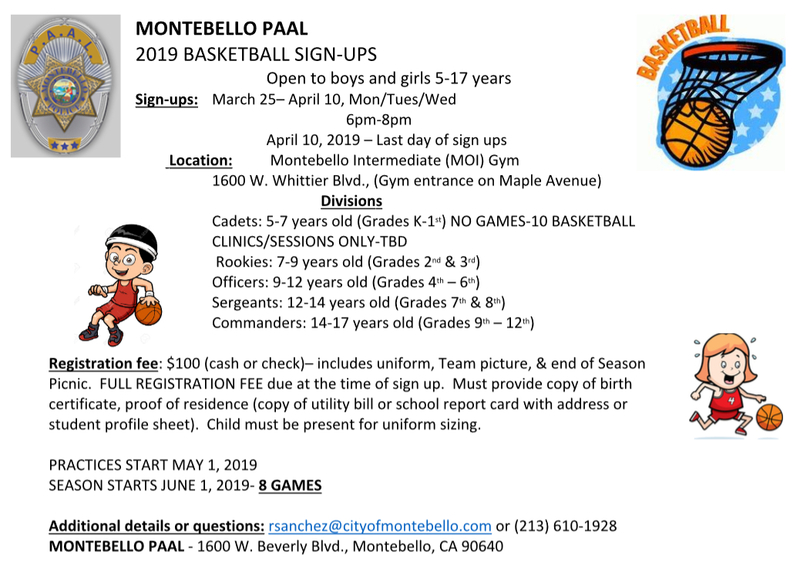 This summer Montebello PAAL has the opportunity to partner with a state-wide charter school that has funding for summer youth programs in California. Fortunately, what we do qualifies for this resource. Last year state-wide $1.2 million was provided with over 20,000 children and youth participating. In a nutshell, for every 12 hours of program time that we document, Montebello PAAL will receive a donation for each child/youth that is registered. 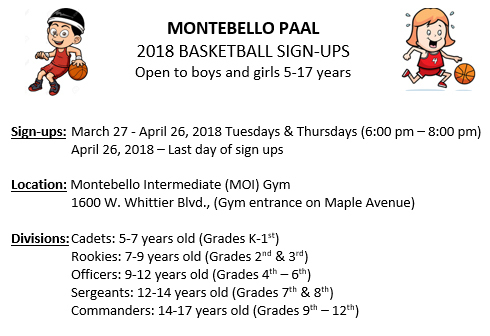 As part of our registration process, you will be able to register your son/daughter which will benefit them by supporting the events and activities that Montebello PAAL provides. In addition, this partnership will be offered every summer and will be an on-going source of support to Montebello PAAL which will allow us to keep our program fees at the current rate. WHEN: Saturday, July 21, 2018 from 9:00 a.m. – 3:00 p.m.
League and the Leadership Foundation in each market. First Come – First Serve! Limited Enrollment. 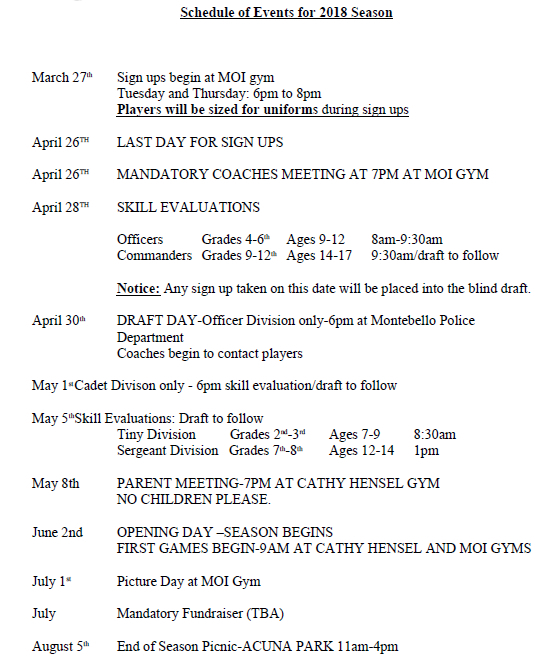 Registration fee: $100 – includes uniform, Team picture, Insurance, award & end of Season Picnic. FULL REGISTRATION FEE due at the time of sign up.